LOS ANGELES (AP) — Lou Williams continues to prove that he is not only the Los Angeles Clippers‘ most valuable player, but the NBA’s leading candidate for Sixth Man of the Year. 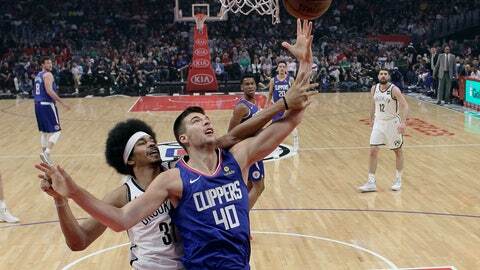 Williams’ buzzer-beater capped a rollercoaster game where the Clippers squandered two double-digit leads in the second half and the Nets saw an 18-point cushion in the second quarter evaporate before halftime. The victory was Rivers’ 300th as Clippers coach, making him the seventh coach in NBA history with 300 or more regular-season wins with two or more teams. Los Angeles led 116-106 with 1:02 remaining, only to see Brooklyn score 10 straight points and tie it with 5.3 seconds remaining on DeMarre Carroll’s dunk. The Clippers called a timeout to set up the winning shot for Williams, who scored 11 of his 25 points in the fourth quarter. D’Angelo Russell led the Nets with 32 points and 10 assists, while Carroll scored 22. Jarrett Allen had 13 points and 11 rebounds. “Teams are going to make runs, but we’ve got to take the same aggressive mentality that we had at the end of the game and bring it throughout the whole game,” Carroll said. Nets: Spencer Dinwiddie scored 13 points, while Joe Harris and Caris LeVert added 12 apiece. … It is only the third time in 27 games since Dec. 7 that Brooklyn has had a double-digit lead and lost. Clippers: Rivers, who was ejected during the third quarter of Friday night’s win against Chicago, received another technical with 4:35 remaining in the second quarter. … This was Shamet’s 10th game with four or more 3-ponters. Shamet, who had 14 points, leads NBA rookies with 144 3s.